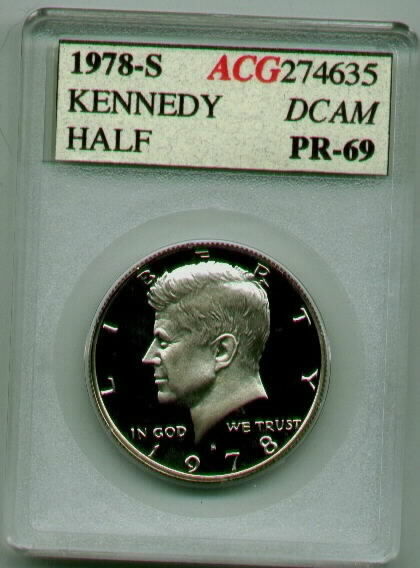 A very sharp looking Kennedy half dollar. 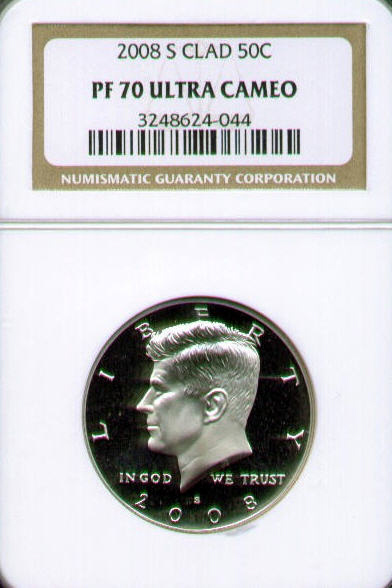 This one is graded and slabbed by Numismatic Guaranty Corporation. NGC gave this a Proof 68 Ultra Cameo grade. 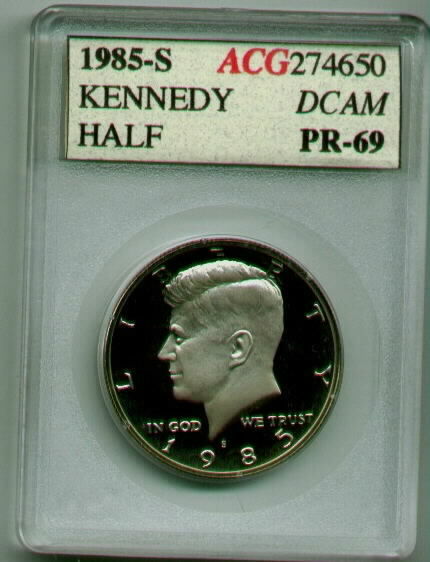 Nice looking ACG certified Kennedy half dollar. It's only 1 point away from perfect, plus it has deep cameo. 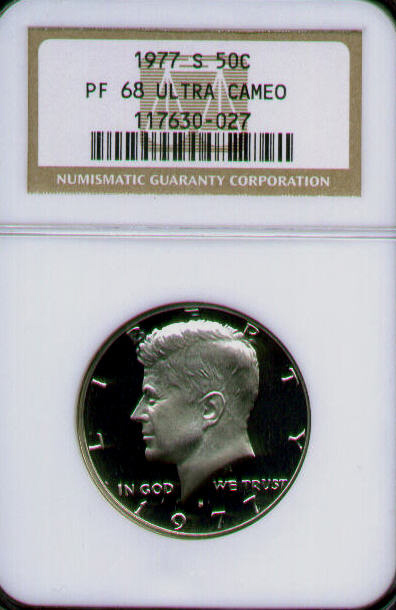 Here we have a beautiful certified Kennedy half dollar. This one is graded proof 69 Frosted White Cameo by ACG. The half has sharp detail awesome frosted white cameo and a bold strike. This 1979 type 1 example has see-across-the-room frosty white cameo. It's graded Proof 69 by Independent Coin Grading. An amazing gem quality example, with smooth glassy surfaces. Bold strike, and white frosted cameo. Nice coin, but it's been around awhile and we want new stock so we a reducing the price. 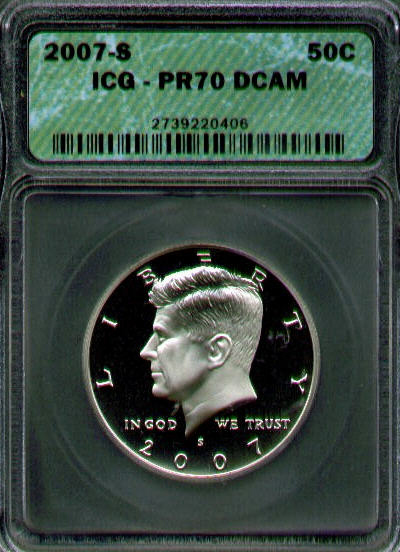 Here we have a 2000 silver half dollar in a PCI old green holder. 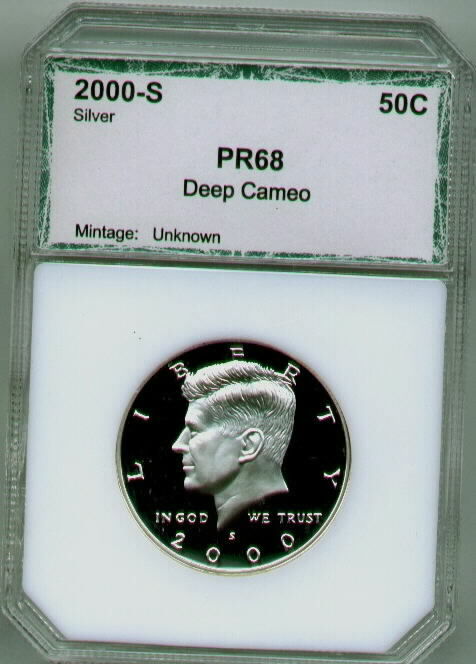 They graded this silver half dollar as proof 68 Deep Cameo. 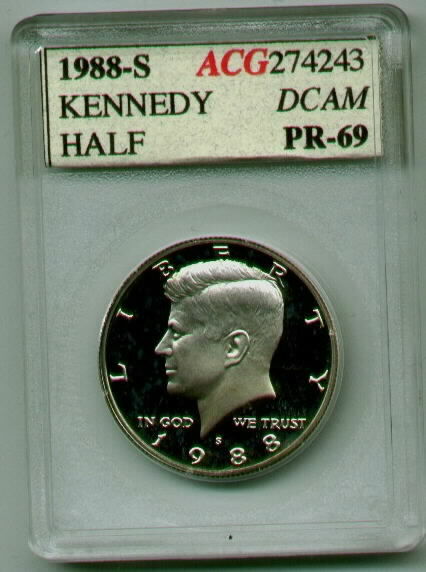 A very sharp looking Kennedy half dollar. 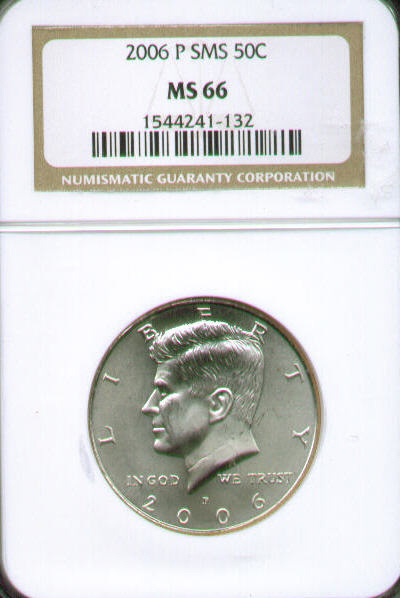 This one is graded and slabbed by Numismatic Guaranty Corporation. NGC gave this a Proof 69 Cameo grade. A 2000 half dollar in a PCI old green holder. 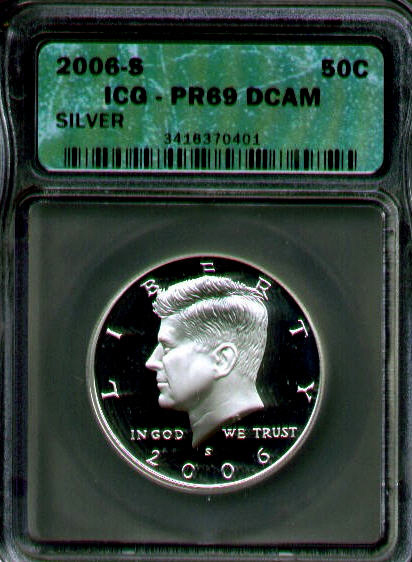 This coin has mark free fields, razor sharp details and Black and White deep cameo. PCI graded this Proof70. A great looking certified half dollar coin. 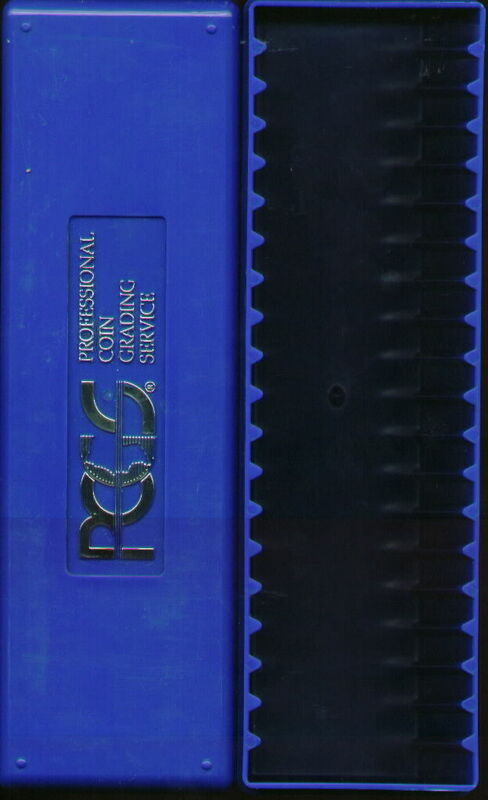 It received a Proof 68 Deep cameo by PCGS. It has awesome black and white cameo and strong bold strike. In 2005 the US Mint changed the way they made Mint sets. This new process insured better quality example with a new satin finish. 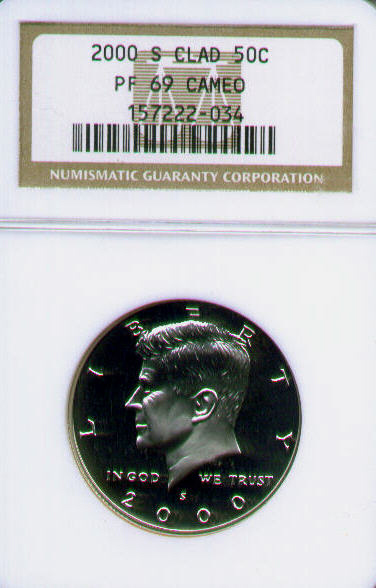 Here is a certified and authenticated example by NGC. They gave this coin a Mint State 66 SMS. There is nothing like the see-across-the-room frosty white cameo that silver coins have. 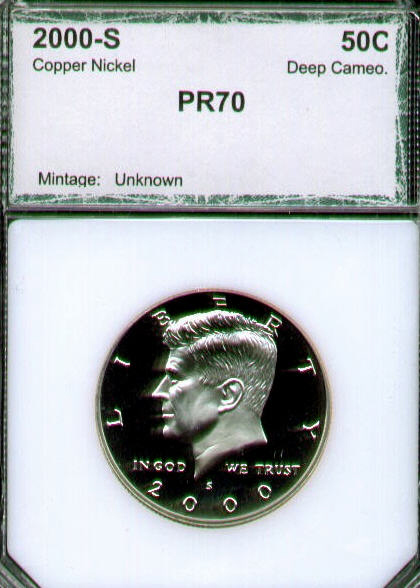 This one is graded Proof 69 by Independent Coin Grading. Here we have a 2006 Kennedy half dollar in a PCI holder. They graded this a perfect score, proof 70 Deep Cameo. 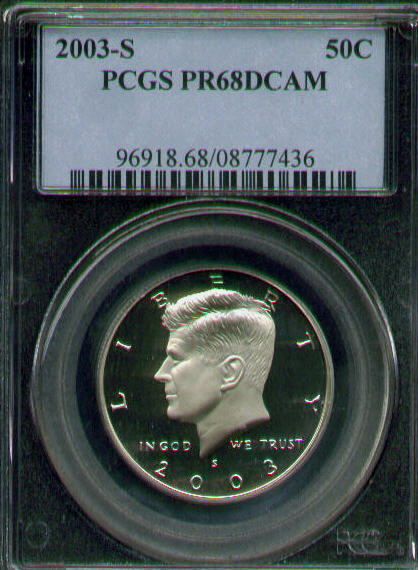 A beautiful example of a perfect Kennedy half dollar. ICG gave this coin the perfect grade Proof 70 Deep Cameo. It has razor sharp details, an ultra strong strike and see-across-the-room frosty white cameo. 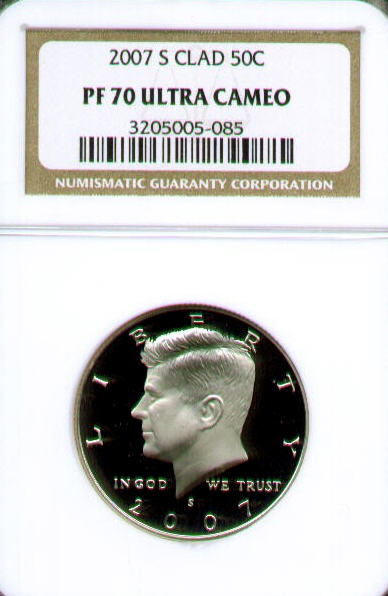 ...same as the one listed above except this one is graded by NGC. 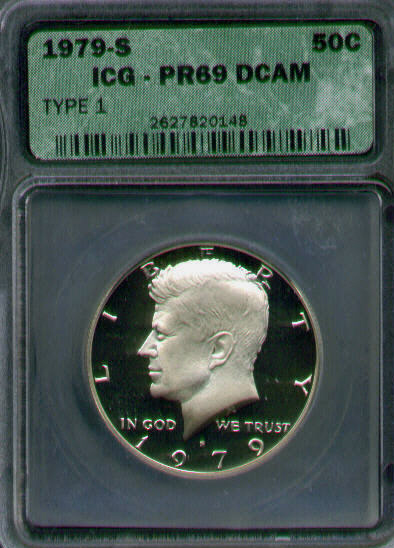 Here we have a top of the line graded Kennedy half in one of the most trusted 3rd party grading services on the market. 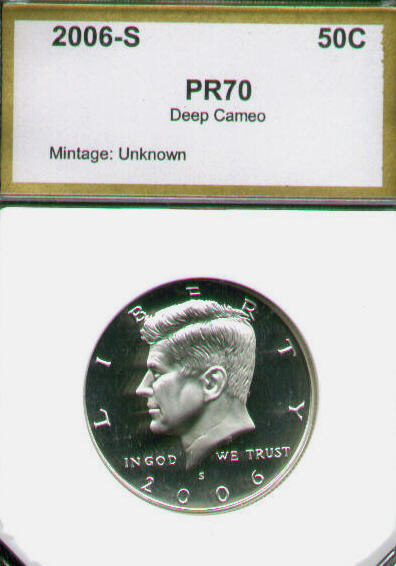 NGC gave this coin the perfect grade Proof 70 Ultra Cameo.